I thought it would be fun to share a fun DIY gift idea for children (or grownups!) 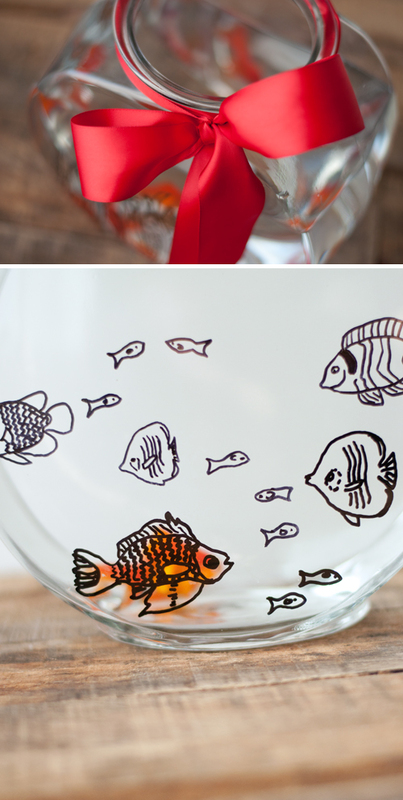 — a simple fishbowl customized with sea-themed doodles! I think watching a little fish paddling around its bowl could be a calming way to spend some time. And adding happy illustrations to the bowl is an easy way to make this simple gift into something special. 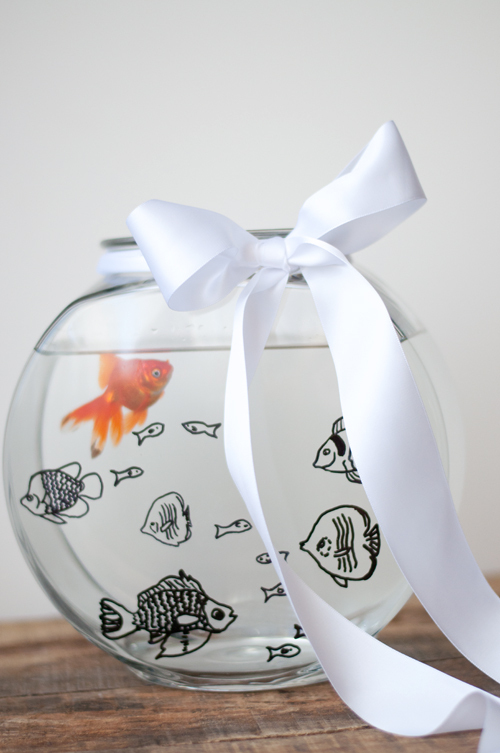 Just think, a simple doodle can transform a plain fish bowl into a fun and interesting home for our finned friends — without having to buy (or clean) extra accessories. If you’re worried about your doodling skills, we took care of that for you. With the help of illustrator Stephanie Frey, we have three underwater scenes you can print off and trace on your choice of fish bowl. You can choose from a school of fish, the ocean floor (with pirate’s treasure! ), and seaweed and coral — or choose all three! Ready to find out how simple it is? Come see! *To doodle, there are a number of marker options. 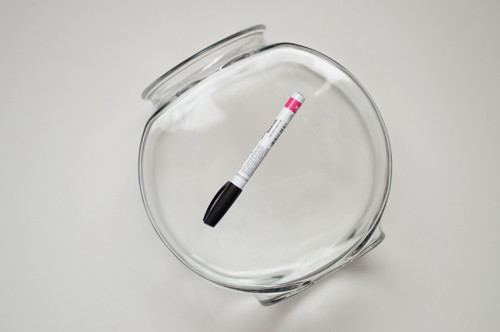 The basic permanent marker will work although it won’t withstand scrubbing but if you’d like a change of scenery often, this marker will work fine. The oil-based permanent marker is what I used. It has better color opacity and really sticks. It can be removed with rubbing alcohol or acetone if you make a mistake. Finally, there is the option of porcelain or glass markers. These are made for drawing on glass surfaces and require a little oven-cure to make them permanent. Just follow the directions of the manufacturer. The only step is to tape the printable in place and then trace it with the marker on the outside of the bowl. That’s it! You might need to resize the print-out to fit your bowl. Most of mine were reduced to between 70-80% size, except the ocean floor which was enlarged to 125%. And feel free to rearrange them to fit your needs. Whatever works! 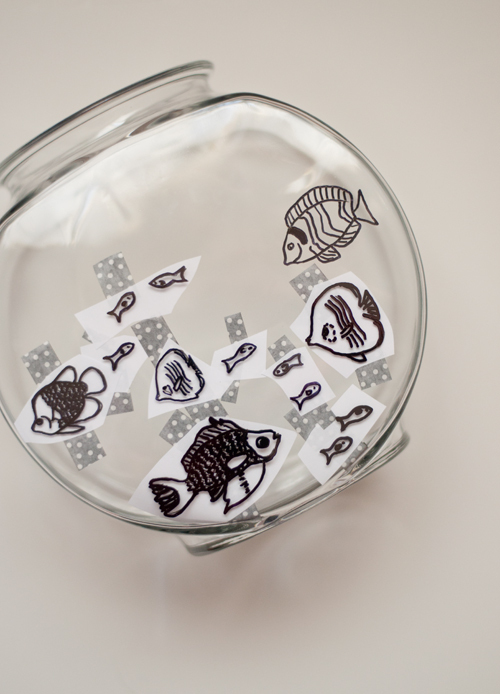 Once you have the doodles just the way you want, add the water and fish (make sure to follow all the instructions for introducing the fish to a new bowl). Note about the fish: A commenter mentioned that Beta Fish thrive in fishbowls, but Goldfish do not. Good to know! Tie a ribbon on and it’s ready to give! Created with Amy Christie for Design Mom. 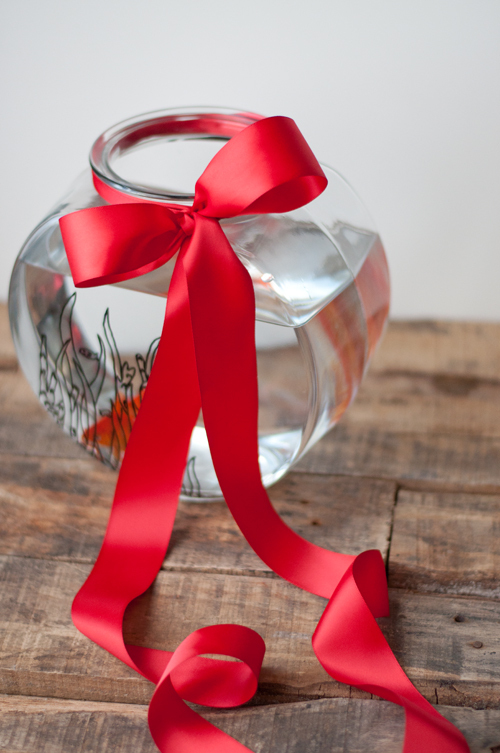 Not to be a bummer, but…you can’t keep goldfish in a fishbowl. Or, I mean, I guess you _can_, but you shouldn’t. It isn’t very humane and they’ll likely die pretty quickly. Goldfish need (1) way more space than that, and (2) filtration. Two goldfish in a 10-gallon filtered tank is pretty much as crowded as you want them to be. A betta, however, will do perfectly well in a no-smaller-than-a-gallon unfiltered tank (as long as you provide a plant or two or a large rock to serve as hiding places), so that would be a good fish-gift. Good to know! I wish they would tell you that at the pet store. I’ll add a note to the post. Yes, I came here to write the came thing. It is VERY inhumane and you are essentially watching your goldfish aphyxiate to death. People think, or fish in fishbowls dont last very long, but there is a reason why – they dont have enough oxygen or space. Please Gabrielle, please put a statement about this on your post or else the ignorance will just continue. They need filtration. Addendum, I see you did. Thank you. Would you consider putting a statement near the beginning of the post? The photos are lovely but I am afraid they give the wrong idea. I donated! It WAS very satisfying to see the ticker go down by one! I donated! So glad to help out this holiday season. Just realized I may have donated anonymously. But I do have my paypal receipt showing Renee Fensin. I donated! I’m so thankful for healthy kids in my life and would love for those in the hospital to have some holiday cheer! I donated! Thanks for the reminder. Thank you, Becca. Glad the reminder helped! Done! Happy holidays to you and your family! I donated! Happy Holidays to Everyone! I so donated. Just for you Gabby. Hope that makes you feel special, I usually only donate to the ALSA. Totally makes me feel special! Thank you. I donated! Happy Holidays to all! I donated! CMN is a charity anyone can believe in… I love donating to them. I donated! Thank you for the reminder. My baby (thankfully) has only ever been in the hospital for her birth but I know that we are lucky. My heart and prayers go out to all those kids and their families that will spend holiday time in the hospital. Much love and Merry Christmas! I donated! Thank you for all you do. Just donated under Nicole Smith. Thank you so much for bringing awareness to such a amazing organization and worthy cause! Happy to help where I can this Holiday Season. Thanks for sharing this and all your other wonderful things! I donated. What a wonderful way to help sick children! Thanks for making me aware of this opportunity to give this holiday season. I love that you are able to choose the hospital where your donation will go. I donated and was able to support a local hospital. Also, I had a gold fish that I kept in a little glass bowl for YEARS. I won him at a county fair, brought him home in a plastic bag and was astounded when he was still alive – he even came to college with me two years in a row. I had him for more than 4 years. It’s so easy to get consumed by life-especially during the holiday season. I’ve been bookmarking your email updates (glad I subscribed) and today’s post REMINDED me what I wanted to do after reading your initial “call to donate” to Children’s Miracle Network hospitals — so today, instead of writing a reminder or putting it off– I donated and I feel great and thank you for doing what you do!!! (PS I definitely posted this under the lunch menu article–messed that up but definitely didn’t mess up my donation which was so easy to do on their website)!! I donated, happy to help! Thank you for raising awareness of this charity. I just donated to our local children’s hospital! Exactly a week ago my 10yo was in the hospital to have a diaphragmatic hernia repaired. He was only in for one night, and he’s doing great-even went to school today, but it was certainly a startling reminder that there are so many kids hospitalized for very serious reasons. It must be so hard on those kiddos and their families. I happily donated to the cause, I only wish I had more to give. Happy Holidays, thanks for all you do! Thank you for sharing this opportunity to donate to the Childrens Hospital. I’ll be making a donation in the name of a young man, my daughters age, who was a part of her baby group 14 years ago. Today whilst the other babies from that group , are living all over the world , experiencing high school and looking forward to Christmas , he is struggling and fighting to overcome the immune response to a bone marrow transplant to treat lymphoma. I have been wondering many times what could I send or do that could help him and his family, and the idea of a quiet distraction, is very appealing. However I can’t help but admit that I am conflicted about the idea of an animal used in an ornamental/decorative way that doesn’t take into account it’s needs particularly for a healthy habitat. I’m sorry to bring negativity to your post , but I felt I had to share. There are places that have banned the use of fishbowls. The reasons are set out in this site..
Now, a properly maintained aquarium (ie one that is large enough and with a filter) would be a great thing for a hospital patient, especially a child, – perhaps there are companies that could provide a”rental” service with visiting carers to mainatain them for young patients? Wouldn’t that be a fabulous service. Not as fabulous as beinghealed of course- so I’ll go make a donation for Nils now. What a great cause to champion! We donated! I donated. Thank you for bringing this forward, I take my daughter’s health for granted and this reminded me that we are so lucky, we have to help others. I donated! Normally I choose St. Jude but I love what this organization as well. :-) Tis the season of giving! Gabrielle, this is such a great cause. Just chiming in that another much appreciated thing people can donate is blood. My brave and beautiful 3-year-old niece is fighting leukemia and has received many transfusions that are just one of the things saving her life. Every time Hazel receives blood we all think about what kind stranger might’ve taken the time to donate it. I donated :-) Thank you for raising awareness. Thank you for the information and motivation to donate. I feel thankful that I’m able to donate to such a wonderful cause. Thank you for this. I donated under my son’s name: Luke Thompson. He’s scheduled for surgery at seattle childrens hospital next month. The doctors and nurses at these hospitals are angels. And the children are just the sweetest. I’m sitting at home in my apartment sick and have been watching Christmas movies after Christmas movies. Last night I watching one about a little boy with cancer, I cried my eyes out. With your post today I just had to donate, thanks for posting! I donated in the names of my healthy sons, Sean and Luke Belt. With deep gratitude. I donated! We have a CMN hospital in Tucson. Thank you for what you are doing to help raise funds to make the lives of these children more cheery! Thanks for the reminder. We donated and our thoughts are with the children that have to spend their christmas at the hospital. I have to agree that a goldfish would be unhappy, but a beta fish will do fine in a bowl and is even prettier to look at! OK, you convinced me. I donated. If it were one of my kids, I would be pushing for more donations. I am so blessed with healthy kids, so I will donate for someone else’s kids. I donated! Thanks for making me aware of the opportunity to help. I donated. I’m thankful to have healthy and happy nephews and hope these donations go a long way to help others not so fortunate. Thank you for sharing and Happy Holidays to you and your family Gabrielle! I donated. Adorable DIY, and so nice of you to run this promotion to encourage the donations for such a great cause. I donated (Holli Yoho). Wish I could do more. Merry Christmas! I love that I could direct my donation to my local (relatively) hospital – WVU Children’s, that makes it even better for me! :) Thanks for the nudge! Donated!! Thank you Gabrielle – for shining light on such a great cause. I am so lucky to have a healthy 4 year old son but – as anyone can tell you – life can change in an instant. Nice to see you always, ALWAYS using your blog in a positive way. It’s heartbreaking to think of these children spending the holidays in a hospital. $5 is not a lot to ask to help bring a smile to a child’s face. From one mom to another – THANK YOU and Merry Christmas to you and your family. Thank you! I just donated and it was a perfect thing of joy. Despite being majorly broke giving always makes me feel GREAT!! I donated! Thank you for the information and motivation to donate. My heart goes out to every sick child this holiday season and I am ever so grateful for all the blessings our family has. This is a great organization that helps millions of kids in need. My son was diagnosed with an autoimmune disease this summer, and we’ve made about a dozen trips to our local hospital since then for clinic visits, treatments, and yes–even the dreaded overnight stay. I feel blessed and lucky that he’ll be home with us ( and in good health) this holiday, but know that might not always be the case. What’s more, every time we’re there, I see a child whose needs are even more dire than my child’s and am reminded how quickly things can turn, for all of us. Thanks, Gabrielle, for thinking of these kids and encouraging your readers to give. I did, and it feels great! Just donated :) Happy to help-thank you! This is such a worthy cause but the number of hospitalized children is way too high, at least if you are talking about in the US. There are fewer than one million hospital beds total in the US, so even if every one were full, there would not be this many patients. Wonderful cause. I was pleased to donate. I donated – and I loved that I could pick our local hospital. It’s nice knowing you are helping sweet kiddos, but even more awesome when you know that these are kids in right in your own “backyard.” Thank you for raising awareness for this cause! Our family donated! And if you donate more the tracker moves down in relation to the donation amount…nice feature for the kids to see! Happy holidays! Thank you for helping with such a great cause. I donated. I donated. I’ve been having to take my baby to the deep suction clinic at the hospital the last couple of days. A child having to spend Christmas in the hospital breaks my heart! Thank you for bringing this to mind. I donated in memory of my mother. What a fun idea! And a great cause! We happily donated! I do feel warm and fuzzy after donating! I donated under BP. Fun giving opportunity! Thanks, Gabby! subscription hyperlink or e-newsletter service. Do you haave any? Kindly prrmit me recognize soo that I could subscribe.